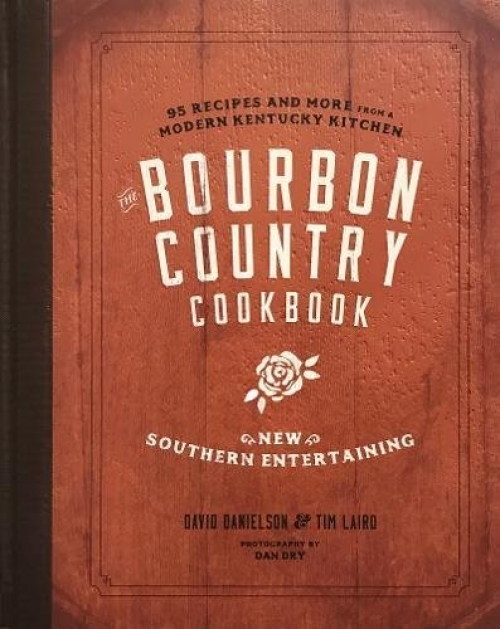 �The Bourbon Country Cookbook: New Southern Entertaining (Surrey Books; $29.95/hardcover) is a tour of Bourbon Country and modern Southern entertaining through recipes developed by David Danielson, executive chef at Churchill Downs, and Tim Laird, chief entertaining officer of Brown-Forman, the parent company of Woodford Reserve and other bourbons. Bourbon, the first uniquely American distilled spirit, is nearly synonymous with Kentucky, its birthplace. The region conjures images of verdant hills of bluegrass, rolling pastures punctuated like an intricate quilt with horse farms� defining white fences, cold bourbon cocktails sweating in the sun, and hundreds of well-dressed race-goers urging their steeds of choice to the finish line � all culminating into one distinctive southern heritage. However, bourbon has come a long way since it was first distilled in the late 1700s, and its popularity and refinement have never been greater. At the same time, southern cuisine has evolved to keep up with bourbon�s evolution through once unheard-of collaborations between kitchen and bar, a renewed interest in seasonal local ingredients, and the influence of the delicious food traditions of the region�s growing migrant populations. This book distills the spirit and hospitality � both new and old � of great southern food and drink into 90 accessible recipes designed to help you achieve the ease and elegance of Bourbon Country entertaining in your own home. Arranged by the kind of traditional fare you�d find on a Kentucky table�pickles, vegetables, ancient grains, bounties from the barnyard, bourbon cocktails, and more�these recipes pay homage to the rituals and victuals of yesteryear while embracing the new southern palate and the flavors of modern Kentucky bourbon. Before joining Churchill Downs, chef David Danielson had directed a high-end catering company that specialized in global events and was also executive chef at Rockefeller Center and the United Nations Plaza Hotel. Five years at Churchill Downs has proven to him that it is as challenging as any of his past venues. �I had traveled all over the world doing large events. Everybody has a bucket list. Being the chef at Churchill Downs was on my bucket list. The Kentucky Derby is like no other sporting event for chefs because food and beverage are such a large part of the experience for guests. To be able to have an impact on that was a very exciting opportunity,� says Danielson, executive chef at Churchill Downs. Tim Laird is best known as �America�s Chief Entertaining Officer.� He�s written books on the subject, he hosts a weekly television show in Louisville about local chefs, and he travels the world educating people about bourbon on behalf of Brown-Forman.